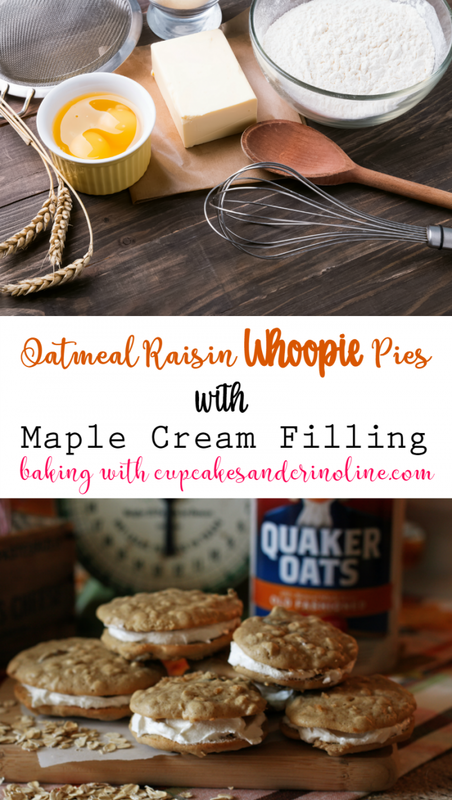 If you love Oatmeal Raisin Cookies these Oatmeal Raisin Cookie Whoopie pies dripping with Maple Cream Filling will put you over the top! 1. Line large cookie sheets with parchment paper. Sift together your flour, baking powder, salt, and cinnamon. 2. Place butter and sugar in a mixing bowl and beat with electric mixer until smooth and fluffy. 4. Add one half of the flour mixture, then the milk and then the remainder of the flour mixture. 5. Gently stir in the oatmeal and raisins. 6. Spoon and shape 24 mounds of batter on the cookie sheets making sure to allow room for them to spread. 7. Bake in preheated oven for 10 to 12 minutes until baked through. 8. Cool for 5 minutes on wire racks and then gently remove the cookies and allow to complete cooling. 1. Place the cream cheese and butter in a mixing bowl and beat until well blended. 2. Beat in the maple syrup, cinnamon, and confectioners’ sugar until smooth. Spread the filling on one flat side of the oatmeal raisin cookie, top with another cookie, flat side down and now you have your whoopie pies!